Environmental issues aside, I'd like to know whether solar panels are worth it from a monetary standpoint? How long before payoff occurs? Is technology moving too fast, e.g. should I wait a year or two? Installing solar should be one of the last things you do. You should first concentrate on those things that will reduce the amount of energy you will be using. 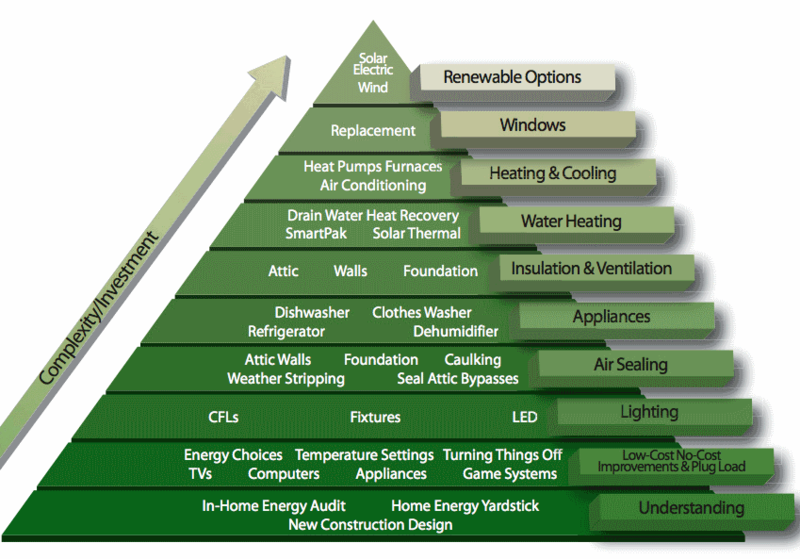 "The Green Building Advisor" has a good article on The Energy Efficiency Pyramid. I believe this article will help you make some wise decisions about where to start. Payoff depends on the state you live in. NJ allows you to sell your energy credits to other companies so in NJ it is about a 3-5 year payback (which is great). Other states have similar programs or offer rebates. Check out One Block Off the Grid (http://1bog.org/) if you are interested in solar panels. They have been great at getting information about the pros and cons and also the benefits on adding solar panels (plus discounts for your entire neighborhood and a local contractor). It will increase your houses value. Depending on the state you live in you could hit payback very soon (and make a good profit after that). You will just feel good about getting environmentally friendly energy. Your electric bill will be much lower each month (you still draw electricity during the night since batteries are just not worth it yet and most electric companies do not pay you money... your bill could be $0 though each month). Your roof should be in good condition before installing the solar panels. Up front cost (some states do not have any incentives). You end up with something on your roof that will not necessarily increase your house's curb appeal. In my opinion if you live in a state that has good rebates or incentives to get solar panels then I would do it. I live in NJ and I am so tempted to get solar panels but my hesitation has to do with not being 100% sure I will be in my house in the next 3 to 5 years and also the age of my roof, it is 15 years old and really needs to be replaced first before installing solar panels. It depends on your point of view. PV cells are a gamble from a financial POV... depending on the state you're looking at and if you finance you're looking at a 5-12 year payback. The cells are supposed to last 20-25 years, but you may need to replace some equipment after 10-12. Energy prices will probably rise. Peak energy demand drives energy prices, and is likely to continue increasing. PV Cells generate power during times of peak demand. You're making a positive environmental/carbon impact. Tax credits and other incentives are driving the market. Where you live matters more than for most things. It's difficult to shop around, IMO. Is vendor X better than vendor Y? If the tax credits disappear (this happened in the 80's), will your manufacturer be around to honor that 25 year warranty? The financial models all involve risk. If the cells are destroyed in a hailstorm or something and insurance doesn't cover it, there goes your return! Electric rates may not grow! If you finance the system, you're mostly displacing utility cost for debt service for several years! From a dollars and cents point of view, the best alternative energy story out there is solar hot water. You spend alot more money heating water than you realize, and you can put in a solar hot water system for a few thousand (versus $40k - rebates) dollars and start recouping your investment in 3-5 years. Also, depending on your geographical location, you might not get enough sun every year to make it worth. That would be an issue for me for example (though I'm not from US). In some places you can lease solar. They maintain all upkeep. You pay a bit extra each month but have no upfront costs. I can only post one hyperlink, but know of three companies. They are Solar City, SunRun and Sungevity. Very late in answering this, and my computer's wireless modem is acting up, but ill try my best from my phone. Assuming only the 30% tax rebate (i.e. not including state, local, REP, etc. incentives,) the payback on PV is roughly 15 years. The good thing about it is that as electricity gets more expensive (a long-standing trend with only one significant exception: natural gas in the past few years has dropped due to frack drilling), its output will be worth more and more each year. Assuming exponential growth, if a system pays itself off the first time at 15 years, it will pay itself off a second time at roughly 23 years and a third time at roughly 28.5 years. Aside from hail (youll have to figure out if that is a problem or not) and extremely high winds (120+ mph), PV panels last roughly 30-35 years, where their end of life is determined by a loss of ouput by some percentage (20-30%... I forget.) They will DEFINITELY pay themselves off... and they should pay themselves off roughly 3 times over. In regards to the possibility of the price of solar dropping, I wouldnt plan on that happening. My guess is that any savings from economy of scale, etc., will probably be offset by reductions of incentives. Even if incentives stay the same, though, the price isnt going down much since trasportation, copper, reasonable wages/profit based on the (high) difficulty of the work, and other unavoidable costs accounts for the majority of the system cost. Systems sell for probably 6.50/watt on average, and the panels only account for about $2.00/watt. Other material costs, like the copper wiring and inverter, arent expected to go down that im aware of. Labor costs arent going anywhere either because people arent going to get up on 120-150 degree roofs (most ppl buy solar in the summer) for much less than $16/hr. What there definitely IS room for is improved efficiency of the solar PV systems, which only transform about 13% of the Sun's energy after inverter losses and voltage drop. Those losses are almost completely unavoidable, and the real room for improvement lies pretty much exclusively in the panels, which are about 16% efficient. Cant think of any other useful information to add in regards to PV, but im a solar installer myself, and i try to answer the solar questions that i see on here. If you have any questions, you can ask in a comment or create a new question. All of that said, solar PV is by no means the most cost-effective solar application out there. Solar pool heating is even better. It pays itself off in 1-2 yrs vs. propane & electric and lasts for 10-20 years if you go with a copolymer/PVC design. (Avoid the collecotrs made out of small free-floating tubes and evacuated tubes.) At the end of its life, a solar pool heating system will have saved at least $10,000... probably $40,000 on average. Only downside is the 10-20 yr lifespan and the fact that solar pool heating requires a lot more panels than solar domestic hot water. Scott Adams (Yes that one), recently wrote an article,'How I (almost) saved the earth' talking about his experiences with solar cells. Ultimately he concluded they weren't worth it from a ROI perspective. We have a photovoltaic system for generating electricity. That's the most visible sign of a green home, and probably the dumbest. I expect the system to pay for itself in nominal dollars, perhaps in 15 years. But if I compare it with the most obvious alternative, it makes no economic sense. The smart alternative would have been to wait until the costs for systems like this drop by 50%, which will probably happen in a few years. I confess that we put in the photovoltaic system partly for psychological reasons. I heard great stories of energy meters "spinning backwards" and I wanted in on that. But thanks to our local power company, PG&E, I've been unable to determine if the system is working at all. I know for sure that during the first four months I generated power for PG&E, gave it to them for free and then bought it back at full price. It had something to do with a delay in PG&E getting the right kind of meter installed. Now we have the right meter, but no backward-spinning anything that I can detect. And I think I'm getting billed full price, but I can't decipher the impenetrable documents they send me. I looked into PV systems in San Diego a few years back. Got a quotes from 3 or 4 companies, and after rebates, the breakeven in nominal dollars was 20+ years. Total cost to zero out our electricity bill was around $23k. A few years later, there was around $6k or so of new government incentives over and above what was available before, so I went back to a couple of the same companies and got quotes thinking they would come in cheaper. Same house, same everything. The new quotes came in within a few hundred dollars of the quotes from a few years ago...even with the new rebates. The labor costs went up by $6k to soak up the new rebates, and my end cost and breakeven stayed the same. Moral of the story: Try to avoid using the solar contractors. Educate yourself and do your own design and purchasing, and hire a roofer and an electrician to do the work for around half the cost. I've been following the blog from a fellow Canadian, Dennis S., who has installed solar panels on his urban home under the Ontario microFIT program, whereby the province guarantees to buy your solar-generated electricity at a generous contract price... similar to the popular initiative from Germany. I suggest checking out his blog if you're in Ontario and considering microFIT. Dennis also covers a lot of interesting technical information about solar panels, efficiency, installation, etc., so even if you're not in Ontario, it's a good resource for people interested in a residential solar panel installation. PV is great, but it's even greater when a few things come together at once. First: learn to make yourself NOT waste electricity. This will mean you don't need as large a system. Most people (at least in the US) would be STUNNED to know just how much electricity they waste in a year. You can often cut the cost of a system in half, if you make a real effort to stop wasting. Second: rebates - there are federal rebates, plus state rebates in many states. Third: feed-in tariffs. Federal law requires states to implement energy savings programs. Most states do this by requiring utilities to offer incentives of varying kinds (like rebates for efficient appliances, etc.). Several states offer a feed-in tariff in which the utility not only pays you for the energy you produce with your renewable system, but they pay you a rate equal to or greater than the regular grid price. Here's where it gets good: if you're in a state with a feed-in tariff, usually you can install a system a little larger than what's needed to cover your typical highest use period and still receive the full tariff. If you do that, then take advantage of the federal (and if available: state) rebate(s), you've now got a 30% discount (or more, depending on your state) on the system. So far so good. This pretty much guarantees a payback in a very reasonable time. At current prices, it's working out to roughly 10 years or less, in turn is a 10% annual Return On Investment (RIO) - better than just about any investment you can make in the markets these days. But it gets better. You can accelerate the payback period by focusing on not wasting electricity. The more you cut your unnecessary electric use, the more of your system's electricity is freed up to be sold to the grid at the feed-in rate. In many states, the feed-in rate is higher than the standard electric rate you pay to buy your electricity. In some places, using this method, it's possible to get a payback period as low as 2 - 5 years. That's a 20% to 50% ROI, and after they payback period is done, you're getting all your electricity for free AND making money on it. But, it gets even better - at least in California, though likely everywhere: homes powered by solar have been selling in CA for a premium over the expected sals price, exceeding the cost of the system. If this phenomenon holds throughout the country, then if you have to sell a home with solar panels installed, you will make more money than if you don't have the panels installed. That's only for grid tied installations. For off-grid, the calculations get a bit more challenging - though still, even a 20 year payback is a guaranteed 5% ROI, which you're not going to find in a lot of places. If you're thinking of going off-grid, you will generally do best by cutting energy waste first, which will reduce the cost of the system you need. But for people far enough from a power pole, the cost of running power to the house often far outweighs the cost of an off-grid renewable system. Last I looked at the numbers the price of the panels was dropping faster than the value of the power they generate. So long as that is true you're better off buying power and waiting for the panels to drop. Averaged over 30 years, the trend is for an annual 7 percent reduction in the dollars per watt of solar photovoltaic cells. So long as the payback period is longer than 1/7% = 14.28 years (I'm ignoring interest and inflation but they'll approximately counter each other) you end up with more in your pocket if you wait. (Note that this is discussing utility-scale power production.) The price has nearly halved in 3 years--unless your payback was less than 6 years you lost out by installing in 2010 instead of 2013. My neighbour has a solar grid and one gotcha he told me is that if any of the panel is in the shade, then the whole panel produces 0 volts. He cops shadows from my house plus a house 30+ metres away. Check your prospective panels to see if they suffer this limitation and check your roof to ensure you get constant sunlight. Another gotcha (in Australia) is that if you sell your electricity back to the gird then the power companies may charge you more for the electricity you consume from them. YMMV. There have been lots of answers with complex equations regarding ROI and speculations about cost of energy and/or solar panels going up or down. You might consider a different point-of-view. You might consider the "insurance value" of having electricity when others do not. Smithsonian Magazine recently examined the prediction of the much-maligned Club of Rome study, Limits to Growth, and they concluded that we are basically on track with predictions. Notably, they left out some of the scarier curves showing crashing energy availability and steeply rising death rates. This means that things are approaching a nexus, and it is probably not wise to make future predictions based on past performance. So the complex ROI calculations and price trends may have a great deal of uncertainty. The certain thing is that if you buy solar panels today, and for whatever reason, the power goes out tomorrow, you'll still have electricity. Unless your solar panels make you the target of energy thieves. I had 38 x 175W solar panels installed in September of 2008, amounting to a photovoltaic system of 6.8KW. My system has been "cost effective", and has already "paid for itself", but only when taking into account the rebate I received from Austin Energy, as well as the tax deduction I took in 2008. Without those two subsidies, I would still be 15-20 years away from breaking even. Not the answer you're looking for? Browse other questions tagged solar-panels or ask your own question. How do you protect solar panels from hail? Is it feasible to store adequate thermal solar heat overnight? How do you protect solar panels for storage during house rebuild? What hardware do I need for selling the electricity generated by solar panels to the electric company? What's a reasonable expectation for efficiency in modern solar panels? What are the consequences of incorrect positioning of air separator (and swapped return/flow) in solar heating system? Is it worth it to upgrade a solar system to get power from partially obstructed panels? Would solar panels save money with electric baseboard heat? Heat large pool with electric via solar panels?